Ranchi: Eighty-one year old Stan Swamy isn’t going to be gagged or intimidated. He speaks gently, but clearly. He says that both the governments: the one in Jharkhand and the one in the centre, are busy trying to frighten people who have begun to speak out against mismanagement and failure to govern. “What do you do when winds are against you? You threaten voices of dissent with lathis at your command,” he told a journalist, implying that the BJP led government was rattled. 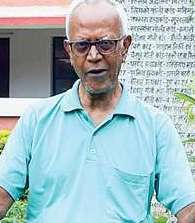 Jesuit priest-activist Stan Swamy, whose home was searched as a part of nationwide raids against activists dubbed “urban Maoists”, says that unlike previous governments, the ruling BJP-led dispensation at the Centre denies space for dissent. It is an “undeclared emergency” , in the run up to the general and state elections,Fr Stan said speaking to the press at his home in Bagaicha, Namkum, on Wednesday, a day after the Maharashtra police led nationwide raids against Human Rights Activists, in an effort to link them to Dalit violence in Bhima Koregaon near Pune on January 1. Fr Stan said he did not know how he came into the picture in the Bhima Koregaon case and added he told the Pune police team on Tuesday that he was ready to face any grilling. He demanded all false cases against activists be dropped and human rights panels probe into Tuesday’s multiple raids. Fr Stan said he remains a “thorn in the flesh” of the state, referring to the sedition case against him and 22 others in the ‘pathalgadi row’. The tribal ritual to honour ancestors with stone plaques has been projected in several quarters as ‘an anti-government self-rule movement’. Charged with supporting it, Swamy said he supported its original form. The pathalgadi protests needed to be understood in the larger context of anger at the government. “It was a sign of dissent among tribals. What has the government done to solve the basic issues except tokenism and fear tactics?” he asked. Fr Stan echoes what several others have observed. The Jharkhand government chanted the development mantra but changes on the ground were too few. “How many Momentum Jharkhand MoUs fructified? Or even those signed by past governments? Only a handful. Most did not as land isn’t available. The government claims it has chunks in its land bank. I have extensively studied the land bank and found rivers, mountains, burial sites and the likes included in it,” he stated.